I went into Norfolk's main library on Saturday morning and asked for a book from the reserve collection. The librarian was in his early twenties, had a beard and wore a T-shirt with a slogan. Great to see a hip young person working in a library I thought. When I asked for the copy of a biography of Stockhausen the young librarian looked blank and asked "How do you spell that?" Clearly the librarian hadn't seen the surprisingly high profile media coverage of Stockhausen's death. But he is also one of the internet generation, and my server data currently shows very few Google searches for Stockhausen. Far lower than, for instance, Rostropovich following his death. Yes, it is a weekend, but internet traffic yesterday was low even for a Saturday. I wonder if that young librarian read Ed Vulliamy's tribute in today's Observer? - "The fact is: no Stockhausen, no Pink Floyd, no Stockhausen, no Velvet Underground or Yes, certainly no Brian Eno. Probably no Radiohead either". Have I have accidentally stumbled on the acid test of cultural significance? - can the librarian spell it? No chance for György Kurtág or Peteris Vasks. But I wonder if in thirty years time a librarian will be able to spell Radiohead? Coming to that, I wonder if in thirty years time we will have any librarians? * Perhaps that young librarian should read Karlheinz Stockhausen - part of a dream? 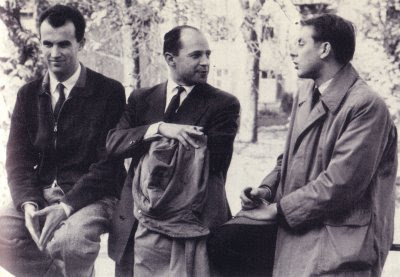 * Header photo is from one of my recent articles on Pierre Boulez and shows from left to right, Luigi Nono, Boulez and Stockhausen. 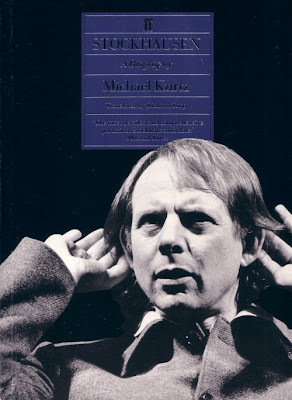 * Below is the book that was in the library's reserve collection, the English translation of Michael Kurtz's Stockhausen biography (Faber ISBN 057117146). Is it significant that this book is out of print? The library copy has been on loan ten times since 1996. It is a nice tribute to Stockhausen by Ed Vulliamy in the Observer. Shame, though, that Vulliamy gets the day of Stockhausen's death wrong. As another newspaper journalist once famously said - 'Until bloggers deliver hard facts … paid for newspapers will continue to set the standard as the only show in town'. At first, I thought it was a joke, but I quickly became engrossed. I am proud to say that by the time I finished High School I had ALL the DG stockhausen releases. Not hard to do since they were being quickly deleted. I paid as little as $1.99 (1979 Cdn prices) for Kurzwellen, and .99(!) for Opus 1970. I even got the POLYDOR German release of Sternklang for $4.99 (all those discs were sold off by a dealer for me when I dumped my vinyl at an average of $90.00 a disc! D'OH!). I sued to play Stimmung for anyone who would listen. I still prefer the version of Kontackt without the live instruments. People really forget that Stockhausen was amazingly structured. And his Aus Licht cycle is an amazing bit of theatre.Too many people tried to emulate him, which is why there was a plethora of electronic dreck out there. Having him as an influence was good, but copying outright was a mistake. His style definetly shows the influence of Messiaen without overtly copying it. His music needs a serious re-evaluation now that he is gone and the body of his work complete. While he had his idisyncrasies, no doubt, KS was a sincere and sweet man and as a composer left a legacy of a substantial number of truly great works. And to Ed Vulliamy's list, I would add a substantial quantum of later Miles Davis.